Tanning Goddesses - Tanning Bed Sales and Service! Solar Wave tanning beds come in two models, the 16 lamp (bulb) bed and the 24 lamp (bulb) bed. These beds are made with a durable aluminum frame. Protective acrylics are included in BOTH the canopy and bench - no metal grids! These tanning beds are made in the USA with quality materials. Beds include high-gloss aluminum reflectors for maximum tanning results. Solar Wave tanning beds measure 75" X 34" X 48" . The electrical requirements are 110 Volts on a dedicated circuit with a 20 AMP circuit breaker. More detailed information on the Solar Wave beds is available in our store. Purchase a NEW Solar Wave Tanning Bed Today! Solar Storm tanning beds come in a variety of models. Solar Storm has commercial (220V) and residential (110V) tanning beds. Residential Solar Storm tanning beds come with 24 - 32 lamps. The commercial Solar Storm beds come with 24 - 32 lamp per bed. Made in the USA. Comes in Black standard. Color upgrades of red and silver are available for an added charge at the time of order. More detailed information on the Solar Storm tanning beds is available in our online store. Purchase a NEW Solar Storm Bed or Booth Today! 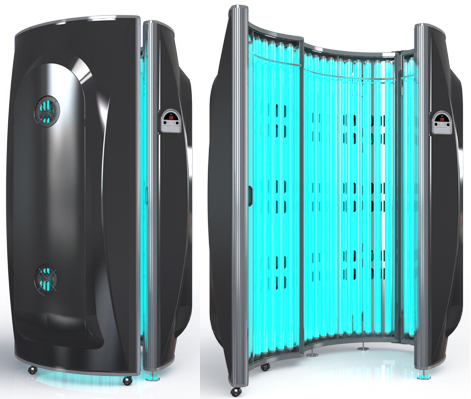 Solar Storm commercial tanning booths have 36 lamps - 48 lamps per unit! Made in the USA. Commercial tanning unit needs to be hard wired - electrician required. Remote ready! T-Max System Compatible. These units are for commercial tanning salons and are not intended for residential home use. Hour counter on timer makes it easy to know when to change your tanning lamps. Tanning booths come with high-gloss aluminum reflectors for the maximum tanning effect and efficiency. Booths are a great way to save space in your tanning salon. More booths allows for more customers to be tanning in your salon at any given time, making you more money. More detailed information on the Solar Storm Tanning Booth is available in our online store. ESB tanning systems come in beds, booths, and space saving stand-up tanning units. Made in the USA! ESB Tanning units come with an aluminum frame. Stylish design. Energy efficient - helps to save money on electricity. Each ESB bed comes with acrylics in the bench and canopy! NO GRIDS!! Stand-Up tanning units like the Elite 10 Can hang up over a door! The ELITE 10 is perfect for apartments, dorms, and small spaces! 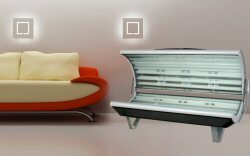 Residential tanning beds - 120 Volt 20 AMP electrical requirement on a dedicated circuit. All ESB tanning units come with electronic ballast. NO choke ballast!! More detailed information on the ESB tanning line is available in our online store. Purchase a NEW ESB Bed, Booth, or Stand-Up Today! The ESB Elite 10 Stand-Up tanning unit hangs over the door! Hang the Elite 10 over a bathroom door! This space saving tanning unit allows this unit to be placed in small areas that a tanning bed or booth will not fit. Perfect for apartments, small rooms, and dorms. Hang this unit over a bedroom or bathroom door! Elite 10 weight 35 LBS. The Elite 10 has casters on the bottom to help support the tanning unit. Comes with a sturdy aluminum frame and 10 body tanning lamp (bulbs). This tanning unit is priced to move and is one of our favorite products due to the versatility and ease of use. 10 Minute tan time. 10 Tanning lamps (bulbs). Purchase an Elite 10 Stand-Up tanning Unit Today! New ESB Galaxy Tanning Booth - 30 Lamps! ESB Galaxy 30 tanning booth has 30 tanning lamps (bulbs). 120 Volt 20 AMP dedicated circuit electrical requirement. Stylish design and attractive black pearl color. Tanning booths are a great space saver because they don't take up the room of a lay down tanning bed. You stand up in this unit and are surrounded by the 3 walls of the tanning booth. 10 Minute tanning session. Made in USA. Purchase a Galaxy 30 Tanning Booth Today! ESB offers different tanning beds models to suit any buyer's need, form price to options you will find a bed you will love. Choose from the Galaxy, Avalon, or Timeless Beauty lay down tanning beds. These tanning bed models are all made in the USA and come with a sturdy aluminum frame that will last for years. Beds run on 120 Volts 20 Amp dedicated circuit. Different lamp configurations are available for each model. The Galaxy tanning bed line comes with all body lamps (bulbs). 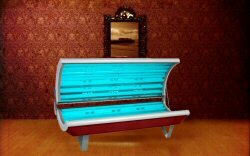 The Galaxy tanning bed line has beds with 14 to 26 lamps. The Galaxy bed is great for people on a budget. The Galaxy is built using an aluminum frame and comes with acrylics in the bench and the canopy. The Galaxy has a mechanical timer. 20 Minute tanning session. 120 Volt 15 AMP circuit on a dedicated circuit. Comes in Black. Has all body lamps (bulbs). The ESB Avalon tanning bed comes with 16 to 32 tanning lamps (bulbs) depending on the Avalon model you choose. The Avalon line comes with a digital timer. Color is silver. Comes with acrylics in the bench and canopy and a sturdy aluminum frame. Has a safety backup timer. Avalon has 1,000 Hour lamp life! Reflectors in lamps! Avalon has body and arm lamps. Has acrylics in canopy too. The ESB Timeless Beauty tanning bed is a bronzing bed. Comes with bronzing lamps! The Timeless Beauty comes with face, arm, and body lamps (bulbs). Comes in a champagne color. Electrical requirement is 120 volts 20 AMP dedicated circuit. Digital timer comes with hour counter and safety lock. Lamps have reflectors. The Timeless Beauty bed has 1,000 Hour lamp life! Comes with a second safety back up timer. Made in the USA. The Timeless Beauty is the perfect choice for someone who wants all the options in their tanning experience. The expert tanner will appreciate the tanning experience they will get from a Timeless Beauty bed. Bronzing lamps are great for people who already have a base tan and will help create that deep dark tan. ©2019 Tanning Goddesses. All Rights Reserved. Website design by Dulaney Drafting And Design.